The old deck rail is torn off and rebuilt to the current deck code requirements per the Georgia Amendments Prescriptive Deck Details based on the 2012 International Residential Code for a safer deck. This project is continued from How to Drill Accurate Holes for Deck Post Bolts. Also see the project introduction at How to Repair a Sagging Wood Deck. The house was built in 2000 and the deck rail predates the current deck code construction requirements. Two 4×4 guard posts were removed to fix the sagging deck and I needed to make repairs, so I decided to tear off the old deck rail in sections and build a new rail in compliance the deck building code with a nicer looking 2×6 rail cap. I bought 8 foot long #1 grade pressure-treated Southern Yellow Pine 4×4 posts from a local lumber yard. The minimum height from the deck boards to top of the guardrail is 36 inches per the Georgia deck code (see Figure 27 on page 15). The existing deck rail is 37-1/2 inches high so I was able to install the guard posts before tearing off the rail cap and pickets. Deck Beam vs Rim Joist terminology: My deck was built using 2×10 lumber for the deck beams that also serve as rim joists. Deck beams and rim joists are two different framing elements in the deck building code (see Figures 2 & 3 on page 4) although the 4×4 guard post attachment with bolts and Simpson deck tension tie connectors is the same. with a wood spade bit. See Figure 29 “Guard Post Attachment Detail” on page 15 the deck building code link (above) for guard post bolt placement requirements. The drill guide made straight holes through the post which are difficult to make freehand. The guard posts will be fastened to the deck with 1/2 inch galvanized bolts with washers and nuts spaced not more than 6 feet apart. Simpson Strong-Tie DTT2Z deck tension ties (“hold down anchors”) are installed so the post and rail will resist a 200lb load per Figures 30 and 31 on page 16 of the Georgia Prescriptive Deck Code. 1/2 inch galvanized bolts with washers and nuts. I’m using 10 inch long bolts although 8 inch bolts would be long enough. I’m working alone and needed three hands to install the guard posts. I solved the problem by fastening 1×2 support braces with Simpson Strong-Tie SD #9 x 1-1/2 inch screws to hold the guard post in place until I installed the 1/2 inch bolts (see next photo). The lower 1×2 block holds the guard post at the required height and bears the weight of the post on the 2×10 beam. The upper 1×2 strip is fastened with a single screw so I can rotate it vertically to slip it between the pickets, then turn it horizontally so it rests against the pickets to keep the post from falling outward. This system worked great! The deck board was removed to better align the guard post and install the bolts and hold down anchor. I going to replace the decking, so it’s no loss. The 4×4 guard post is carefully positioned so the predrilled holes will be aligned with the Simpson DTT2Z deck tension tie, the post checked with the level and clamped to the 2×10 deck beam so it doesn’t slip. I drilled the 1/2 inch holes through the 2×10 beam with an extra long drill bit using predrilled post holes as a guide. The 1/2 inch bolts are installed with the DTT2Z post hold down anchor. I used a socket wrench to drive the SDS 1/4 in x 1-1/2 inch structural screws included with the DTT2Z in the joist. Tip: Tap the screw point into the joist with a hammer so the threads will bite. 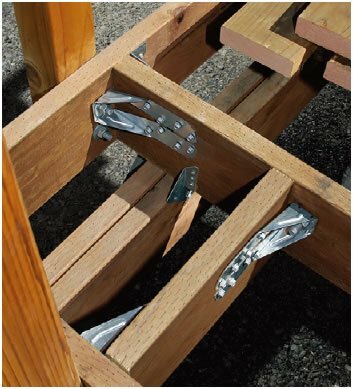 Install an LUCZ concealed flange joist hanger which won’t obstruct the bolts and deck tension tie. Concealed flange joist hangers are only for new construction because it must be installed before setting the joist. That won’t work for my situation. Install a Simpson ML26Z angle with SDS 1/4″ x 1-1/2″ screws on the other side of the 2×8 joist in lieu of a joist hanger. The angle is easy to install and designed to resist vertical shear similar to a joist hanger. Simpson appears to use this method in this photo. You can just see the metal angle on the opposite side of the joist near the top center of the photo. Set back the DTTZ hold down anchor back from the deck beam to allow clearance for the flanges and screws of a standard joist hanger. This particular joist is tilted to the left (out of plumb) and I was able to fit a standard joist hanger. In the future I’ll install an ML26Z angle when rebuilding the rail. See this discussion on DIY Chatroom for other opinions. The old guard post was set against the house wall and the narrow space between the two would fill with leaves and seeds. I set the new guard post back several inches so debris would pass through. Notice the holes in the ledger board flashing because the deck boards were incorrectly installed parallel to the deck joists. I’ll replace the flashing when I replace the deck boards. I soaked the top of the 2×10 beams with Copper-Green Brown wood treatment and sprayed it into the nail holes where I pulled off the pickets and old post. The #2 pressure treated 2×4 top and bottom rails are attached to the guard post with two Simpson Strong-Tie SD #9 x 2-1/2 screws at each post. See Figure 27 “Typical Guard Detail” on page 15 of the Georgia Prescriptive Deck Code for the screw placement details. The deck rail after a 2nd coat of redwood stain toner. The toner darkens with age to match the rest of the deck. My deck stairs were very poorly constructed and in danger of collapsing. I tore down the two flights of stairs, landing, support posts and post footers then rebuilt everything per the 2012 to 2015 (amended) IRC/Prescriptive Deck Building Code. All construction uses bolts, Simpson Strong-Tie metal connectors and Simpson wood screws. There’s not a single nail in it. The 2×2 pickets are cut and installed in How to Build Code Compliant Deck Railing – Part 2. This has been an absolute huge help! I decided to keep my structure below and replace deck and rails. I couldn’t believe how easy it was to kick off the rail posts. They were notched cut which was approved by local inspectors and code. I cannot believe that these are acceptable! I followed your steps for the rails and I must say, are solidly in place! Thanks again for this info! Not sure the height of your deck, but it looks as code would not allow your 4×4 deck post above 8′. 6×6 should be used. Jack your on the mark for knotted post, city inspectors miss it all the time. My deck is about 18 to 20 feet above ground level. Can you provide the Building Code reference that states a 6×6 guard post is required when the deck is higher than 8 feet? I checked the Seattle Department of Construction and Inspections which is based on the 2012 IRC and there is no mention of 6×6’s requirements for guard posts. See the 4×4 guard post in Figure 24 on Page 7 of the Decks, Fences and Arbors for Single Family Homes in Seattle (Updated October 23, 2014). The Seattle DPD – 2012 Seattle Residential Code, Chapter 5 Floors, Section R507 Decks is mainly about the critical deck ledger connection with a minor mention in R507.3 for wood/plastic composite guardrail systems. The American Wood Council DCA 6 – Prescriptive Residential Deck Construction Guide also has no requirement for 6×6 guard posts. However there is no requirement for anything other than 4×4 guard posts irrespective of deck height. Besides, a 6×6 guard post provides no benefit over a 4×4 post because both are fastened to the same rim and/or deck joist substructure. 1. Where you show doubled-up 2×10 deck beams along the outside of the deck, I only have one. Because of the way the joists run, I believe I could add one to the inside of the shorter side of my deck, but not the longer side. Is two 2x10s recommended/necessary? 2. Where the deck meets the house, there are no joist hangers supporting the joists. Instead, it appears the builder supported the joists by installing a 2×2 underneath. I was thinking of removing the 2×2 and using joist hangers instead. Hopefully those questions make sense. I’ve learned a lot reading through these articles but still have a lot to learn. Thanks again. So I guess it’s ok to remove that and replace with the joist hangers. > the deck, I only have one. My deck was built circa 2000 using techniques that are not allowed by the 2009/2012 Deck Building Code. On my deck the doubled Rim & Outside joists function as Beams resting on top of the 6×6 posts. Your deck is probably newer using a single board for the Rim & Outside joists with a separate set of Beams. > 2. ..it appears the builder supported the joists by installing a 2×2 underneath. > I was thinking of removing the 2×2 and using joist hangers instead. Take care to install the metal joist hangers before removing the ledger strip. I used a pry bar to slightly loosen 2×2 ledger to slip the joist hanger under the joist. You only need 1/8 inch of space between the bottom of the joist and the top of ledger strip. Did you use your drill guide to drill the holes through the rim joists as well? No because I drilled the 1/2 inch bolt holes in the 4×4 guard post first, using the guard post as the drill guide through the rim joists. After setting the 4×4 guard post in place, I clamped it to the rim joists, checked it was plumb with the level, then used the pilot holes in the 4×4 guard post to drill through the rim joists. It helps tremendously to drill the first hole through the joist using the 4×4 post bolt hole as a guide, temporarily insert a 1/2 inch bolt through the 4×4 post and joists, recheck plumb and then drill the 2nd hole through the joist. That way both bolt holes are perfectly aligned. Clamping is good for the first drilling but it always seems to drift slightly, thus inserting a 1/2 inch bolt keeps it aligned for the 2nd drilling. Also, it was necessary to change from the spade wood bit to a longer 1/2inch twist drill bit to reach through the 4×4 post and double 2x joists. You can see the long twist bit next to the drill in the photo at the 2nd link above. Are there any connectors comparable to the DTT2 that can be used with 3/8 inch bolts? Note that metal guardrail posts are often attached to the rim using 3/8 inch bolts (4 of them) rather than 1/2 inch bolts. The Simpson technical guide does not address this issue. With an appropriate washer could the DTT2 be used with a 3/8 inch bolt? Could DTT1 connectors (designed for 3/8 inch bolts) be used for this purpose? Again, the Simpson technical guide does not address this issue. 2. Have any tests shown that a post/rim will not hold up to 500 pounds force if there is more substantial rim (e.g. a double 2×10 beam that is bolted at the top and bottom every 7 feet to notched, 6×6 deck posts (as opposed to guardrail posts)? My guess is that more testing will have to be carried out to address questions relevant to all the various types of deck rims and posts. The DTT1Z should meet your requirement for fastening a metal post: “The new DTT1Z fastens to the narrow or wide face of a single 2x with Simpson Strong-Tie® Strong-Drive® SD Connector screws or nails and accepts a 3/8″ machine bolt, anchor bolt, or lag screw (washer required)…”. Click the “View Full Gallery” button on the Simpson DTT Post Connector page at the above link and scroll through the images to see the DTT1 images. You should discuss substituting the DTT1Z for the DTT2Z with your building inspector first because the DTT1 is intended for fastening the deck ledger to the house as explained in this YouTube video. Worse case you’ll need to have your DTT1 metal deck post application approved by a engineer and show the certified letter to the inspector. For load tests refer to the Simpson Strong Tie DTTx Load Tables (first link above) and maybe the American Wood Council Prescriptive Residential Deck Construction Guide. Deck construction techniques not covered by the Prescriptive Deck Guide will need an engineering approval letter. I really appreciate all of the time you have dedicated to help us build/repair our homes correctly. I am also an Atlanta resident, so thank you for your help deciphering building codes I may have otherwise over looked. I just started rehab-ing my 21 year old elevated deck. My deck sits above the walkout basement and is an extension of our kitchen. I recently replaced all of our stairs that began rotting and was working my way to the deck boards and side rails when coming across your site. My intentions are to take the 4×4 guard posts, for the first 6 foot run and extend them up approximately 8′ allowing me to build a pergola overhead my kitchen exit onto the deck. Are there any special considerations I need to identify prior to planning out this extension of the deck? After reviewing your site, I plan to have the pergola attached to the house and extend out to that first 6 feet (ish) to the 4×4 guard post. The main purposes of the pergola besides modest shade are to hide electrical and plumbing for lights and misters. I wouldn’t extend or use the deck guard rail posts for pergola supports because it may cause the Building Inspector question it and require an engineering approval letter for the new design. However, your pergola posts are very similar to my porch roof support posts. I’d build the porch rail in the normal way per the Prescriptive Deck Code then build the pergola inside the deck rail. Use a Simpson Strong-Tie HBC40HDG (it may only be available in Canada but you might buy it online) or the BC40Z half post base connector that I used. The HBC40 is a newer model with drainage channels compared to the BC40Z. Home Depot carries the BC40Z. 1. Install 4×4 pressure treated blocking under the deck with 1/2 inch galvanized bolts where each pergola support post will be installed. If there’s no room for a 4×4 block, install a 2×8 PT block inside the deck beam or on the side of an interior joist with 4 Simpson SD10 x 2-1/2 wood screws. You need enough blocking under the Simpson post base to fasten it with screws through the deck boards. 2. Fasten the Simpson half post base to the deck and under blocking with Simpson SD10 x 2-1/2 screws. The deck boards don’t provide meaningful load bearing support, which is why blocking is necessary. Take care to orient the Simpson post base such that the side flanges are not blocked by the house wall or other obstruction to drive screws into the wood post. 3. This photo of my finished porch calls out the 1/2 bolts for the 4×4 post support blocks. The porch was built per an architects specifications by a contractor with proper building permits and inspections. I installed the post support blocking because it was time consuming working between the 16 inch spaced joist with almost no room for a cordless drill. Thank you for all the great info. I was wondering what bolts or rod you used with your dtt2z tension ties. Were they HDG? And what length? I imagine HDG is compatible with the zmax coating, but not as effective? I used 1/2 inch dia. galvanized hex bolts with washers and nuts as called for in the State of Georgia Prescriptive Deck Code. The bolts pass through the 4×4 post and two 2x rim joists, which is 6.5 inches of wood (= 3.5 inch post + 2 x 1.5 inch joists). Therefore you need a bolt at least 7.5 inches long for two washers, hex nut and face of the DTT2Z bracket. 7-1/2 inch long bolts are uncommon so an 8 inch long bolt is the next standard length. I doubled the hex nuts, with the extra nut serving as a lock nut. This is purely optional. In this photo I was probably using 10 inch long 1/2 inch dia. galvanized hex bolts because I had extra 10 inch bolts on hand which are threaded the full length. Often the hardware store will only have smooth shank hex bolts threaded only at the end. If so you have be careful to buy the correct length bolt so the threads match the thickness of the wood members. > I imagine HDG is compatible with the zmax coating, but not as effective? The Simpson DTT2Z and hex bolts, washers and nuts are all galvanized. It’s steel on steel so there shouldn’t be an issue with dissimilar metal galvanic corrosion. Looking at your stair rebuild at the bottom of this page…do you know if the bottom landing newel post needs to be taller than the deck/stair railing posts? I can’t seem to find much about it online. If it does, how do you calculate it? * Sheet 19, Figure 36 Stair Guard Requirements: “Stair guard height: 34” [minimum] measure from nosing of step”. I added the word [minimum]. * Sheet 20, Figure 38 Handrail Requirements. * Install the stair stringers. * Mark the locations of the 4×4 stair posts at 6 foot intervals. * Temporarily fasten a long & straight 2×4 top rail with a single screw to the deck rail post at the top of the stair. This allows the 2×4 to pivot up & down. * Temporarily set a 4×4 post against the bottom stair stringer and plumb it. * Raise the 2×4 until it’s at a constant slope/height above the stair treads. I set a 2×4 tread on the stair stringer to get the correct nose height. * Mark the slope of the 2×4 top rail along the face of the 4×4 newel post. This gives you the correct height and angle to saw the top of the newel post. Do the same for the interior 4×4 posts. On my stairs the slope means I can’t comply with “Stair guard height: 34” [minimum] measure from nosing of step”. It’s simple geometry the stair rail is much higher (and safer) than the 34″ stated in the code. That’s why I believe the word “minimum” should be in the statement. The newer deck code doesn’t allow a 2×6 rail cap to be used as handrail. I bought a round aluminum deck rail kit with end returns and mounted it lower than the height of the 2×6 top rail to comply with the Deck Code Sheet 20, Figure 38 Handrail Requirements. The building inspector *will* check the handrail is installed at the correct height because it’s an important safety item. The aluminum handrail kit was expensive – about $500 for the length I needed – but I really like it. Awesome post. Im in Phila, PA putting a small.deck on my above ground pool and this was extremely helpful and reassuring as I have started to go the same route you use here. ( very similar code requirements. ) but don’t see too many folks suggest using the Strong Ties which I find ludicrous. I appreciate the thorough walk through. While my design is different, I hope to be just as solid.